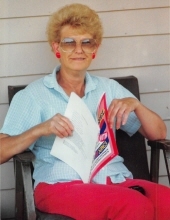 Evelyn Hisel Collins was born May 31, 1945 in Jackson County and departed this life Wednesday, February 6, 2019 at the Compassionate Care Center in Richmond, 73 years of age. She was the daughter of the late Melvin & Iona (Lainhart) Hisel. Evelyn is survived by her son, Ricky (Sheila) Colllins of Irvine and by four sisters, Betty (Nathan) Isaacs of Irvine, Christine (Robert) Harrison of Estill County, Bonnie (Turley) Rogers of Berea and Barbara (Everett) Rogers of Jackson County. She was blessed with a granddaughter, Kaylee (Christopher) Collins of Irvine. In addition to her parents, Evelyn was also preceded in death by three brothers, Thurman, Elmer and Desmer Hisel and by six sisters, Cynthia Adkins, Myrtle Hisel, Louise Lainhart, Eileen Rose, Brenda Fox and Ester Hobbs. Evelyn was a member of the Kerby Knob Baptist Church. "Email Address" would like to share the life celebration of Evelyn H. Collins. Click on the "link" to go to share a favorite memory or leave a condolence message for the family.